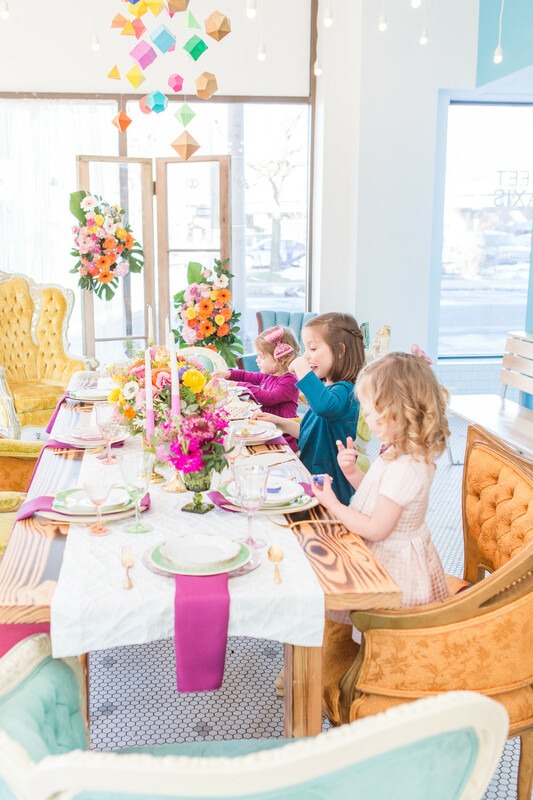 Sometimes the best way to brighten up the winter blues is to start dreaming of bright spring birthday party ideas! 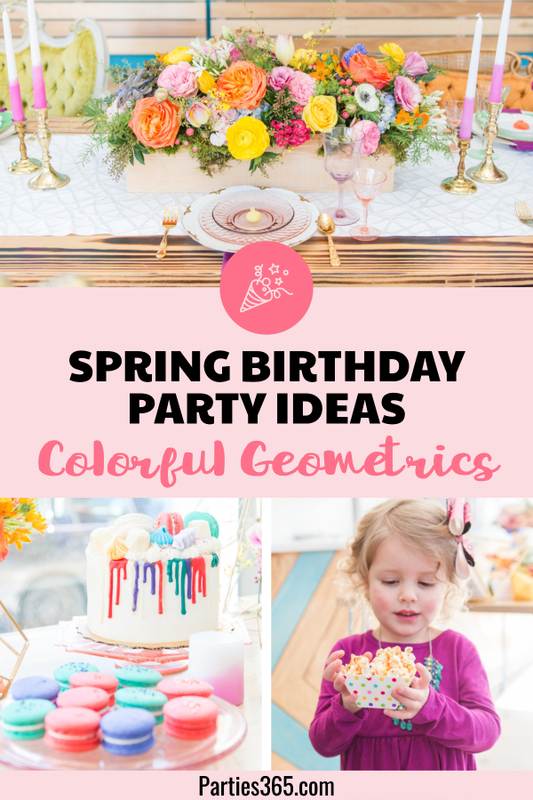 If you’re looking for a fun and colorful birthday party theme for the warmer months ahead, we have some vibrant inspiration for you today with this Girl’s Geometric Themed Party! 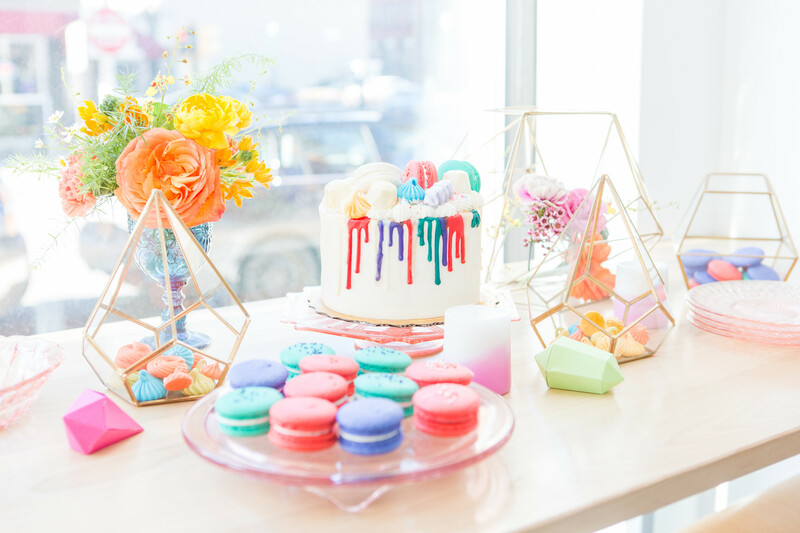 Featuring a geometric paper mobile, brightly colored desserts and stunning spring flowers, this party is sure to remind you that sunny days are right around the corner! 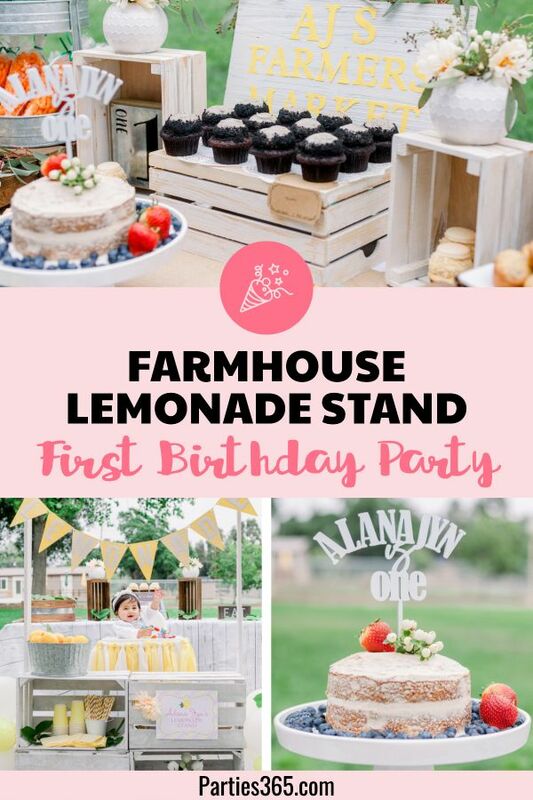 Carianne Gunn of Events by Carianne, designed this bright and beautiful little girl’s party featuring vibrant colors and geometric decor. 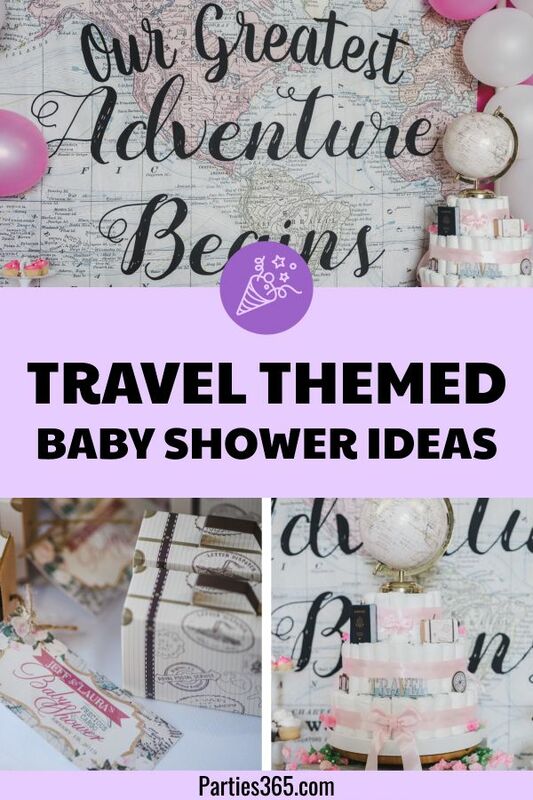 This modern and sophisticated party theme, perfect for little ladies – or their mamas, is versatile enough for birthdays, showers or any other celebration for ladies of any age! 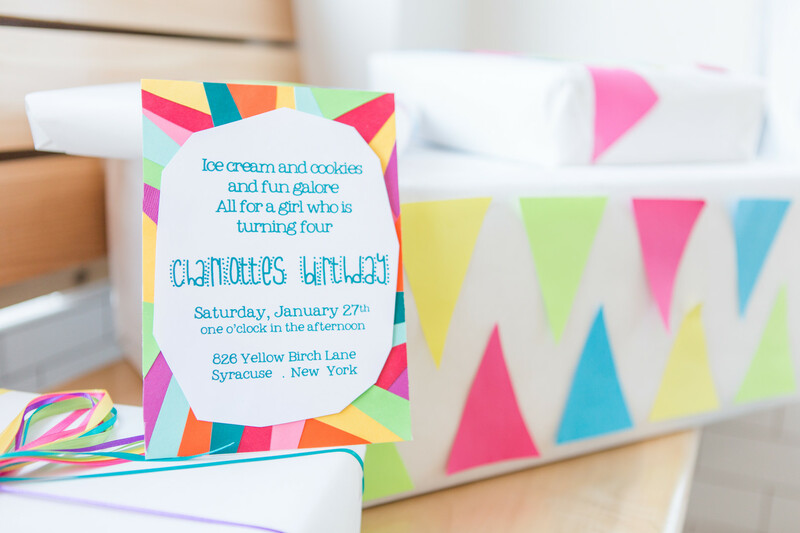 The invitation, designed by Inklings Artwork, sets the tone for the multicolored geometric design you’ll see carried throughout the party decor and signage by Emma Bauso Design. 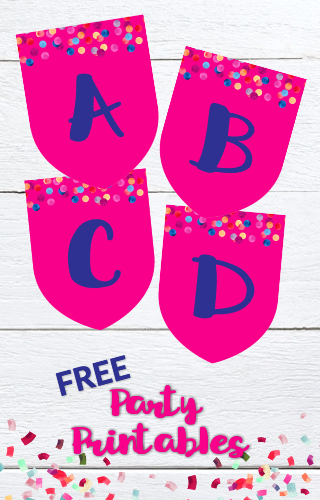 We love how this party illustrates that your theme doesn’t have to be something big like mermaids, dinosaurs, princesses or superheros, but that a theme can also be found in a color or design element. 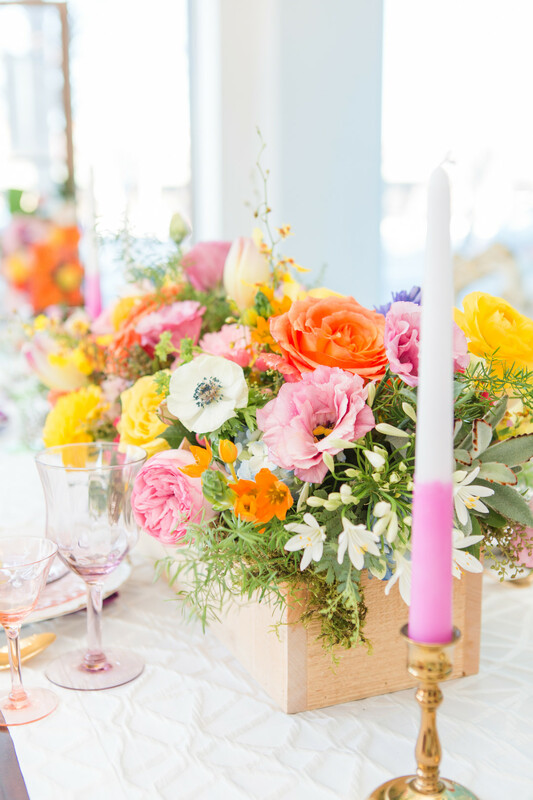 The main party table is a visual feast for the eyes with a stunning centerpiece of spring-inspired florals arranged by heather and a delicate geometric paper mobile hanging above. 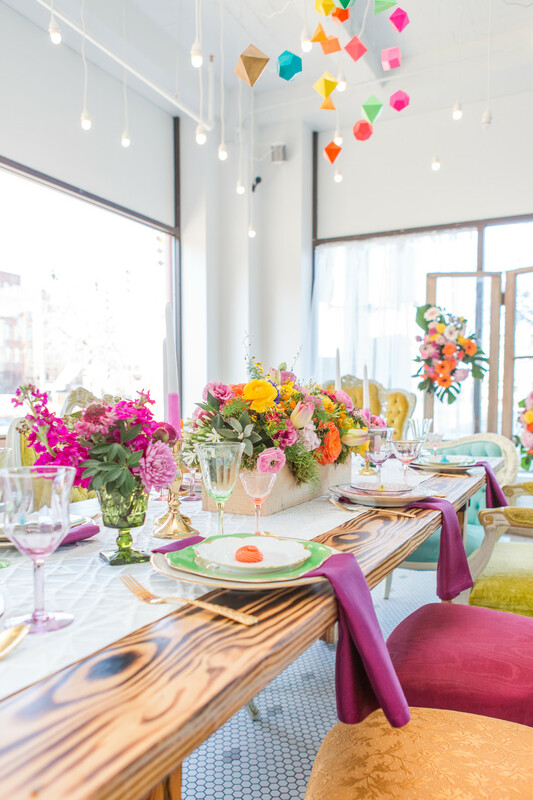 Vintage chairs in bold colors were also rented from She Rents Vintage and Vintage Revival Rentals to add a unique element to the party. 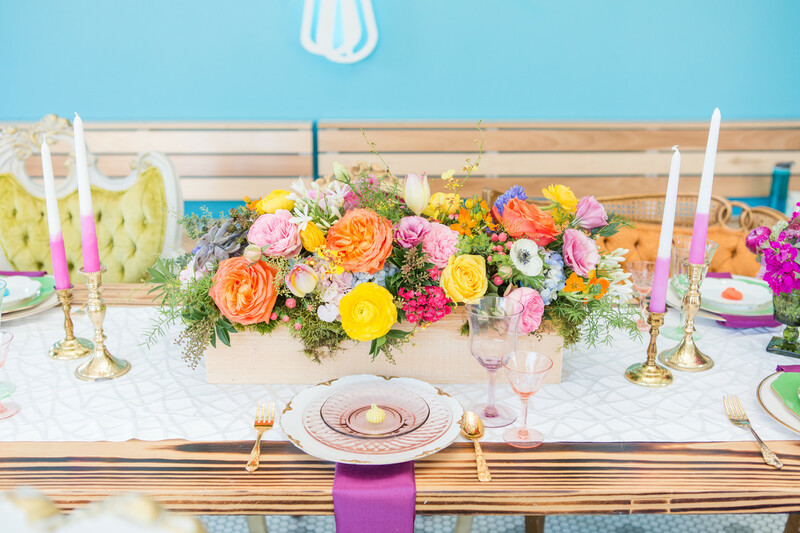 We just love the wooden box overflowing with flowers of every color, shape and size, don’t you? 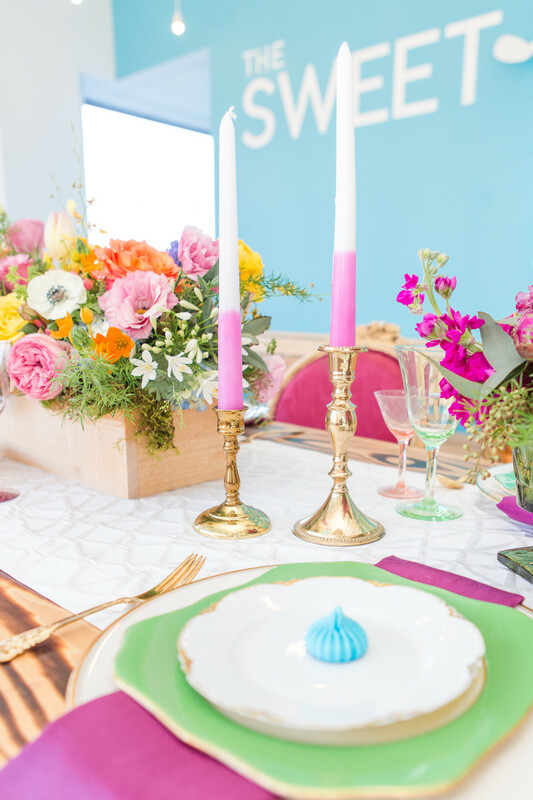 The brass candle holders with pink ombre candlesticks are pretty awesome too and tie in perfectly to the playful, fun design of the overall party. I think this set of three geometric brass candlestick holders would be perfect for recreating this look at home! 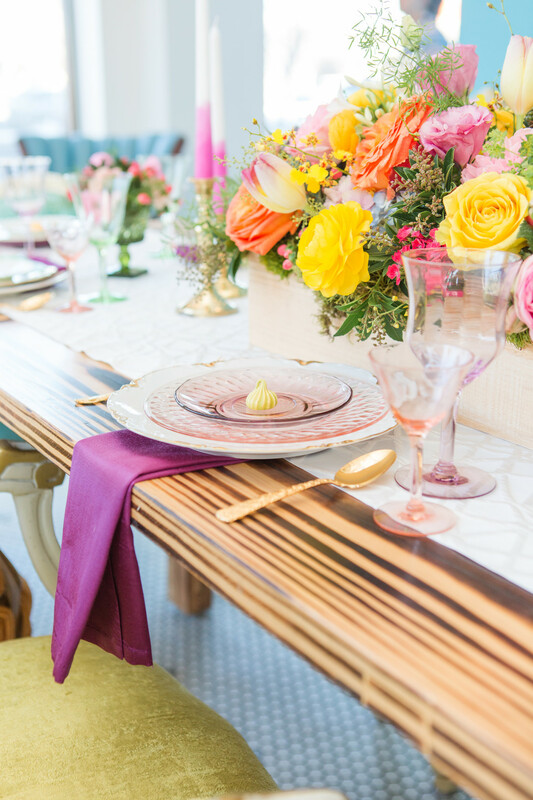 The place settings at this playful table were a mix and match of colorful chargers, plates and pink linen napkins, brought together with gold cutlery, elegant glasses with a hint of color and a meringue on top of each plate to delightfully greet guests! 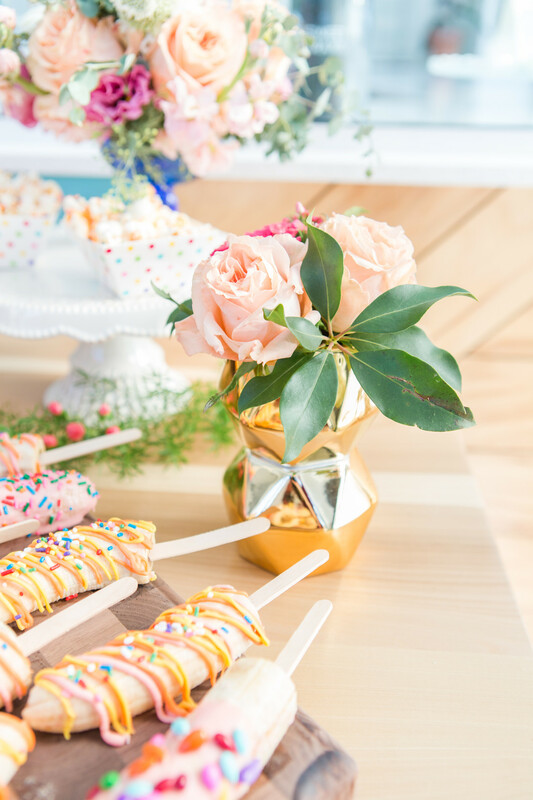 A party with two feature food tables is my kind of party! 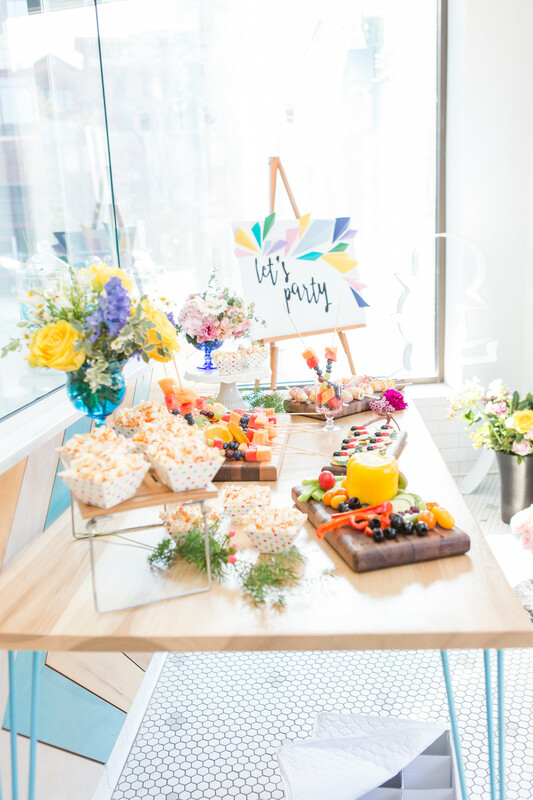 The first table pictured here features more savory snacks like vegetables, cheeses and fruits, while the second table is all about the sweets! 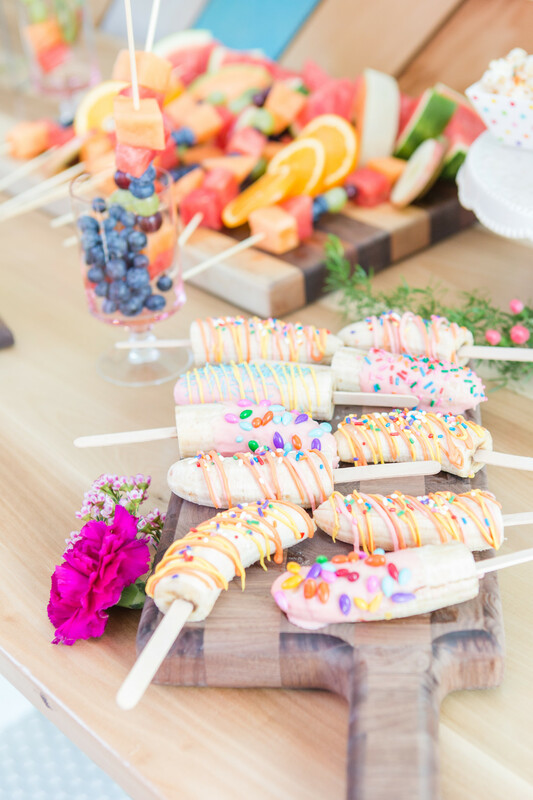 Don’t you just adore the bright colors the desserts bring to the party?! 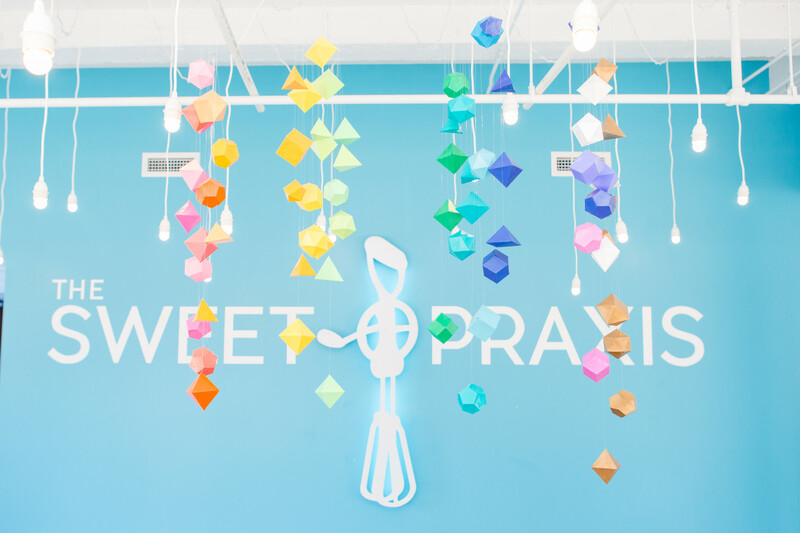 The Sweet Praxis, in addition to providing the venue, created the lovely drip cake, macaroons, meringues and other goodies featured at the party. 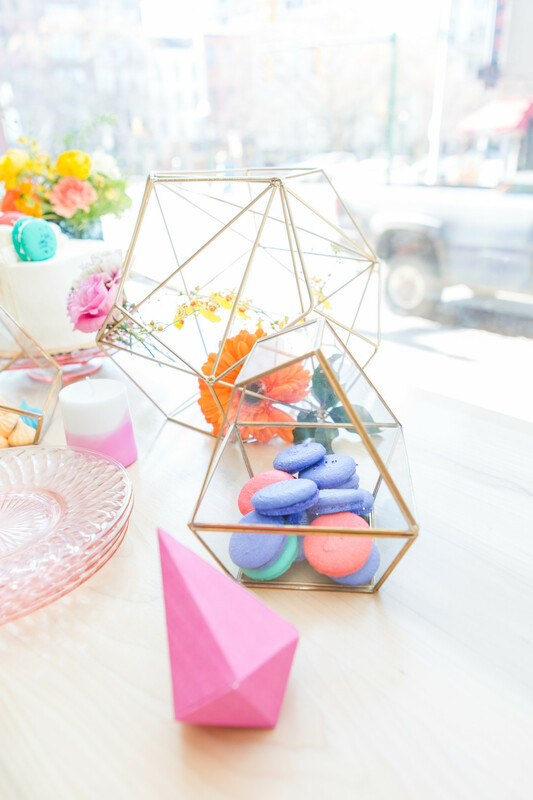 You can see how the geometric theme is perfectly captured on the dessert table with the glass terrariums used as serving pieces and the paper geometric shapes scattered across the table. You can find the glass terrariums in all shapes and sizes, but we love this small, medium and large one! They also make great vessels for holding flower arrangements. 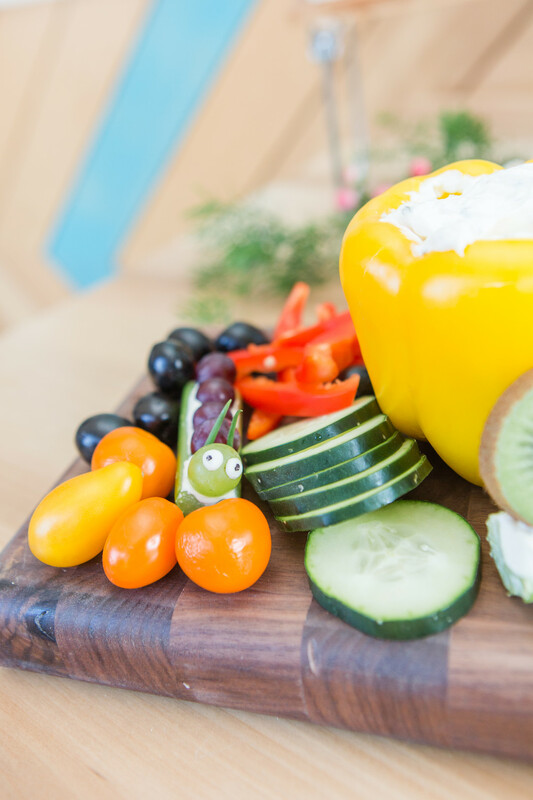 This adorable -and easy – take on a caprese salad is so much fun for a spring children’s party! 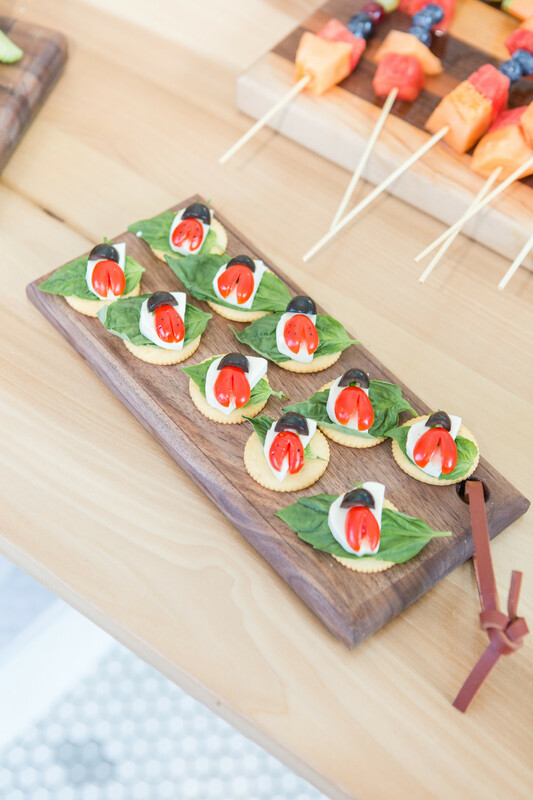 Top a cracker with a basil leaf, mozzarella slice, tomato and an olive and you’ve got a tasty ladybug snack! And cute little surprises like this celery and grape bug are sure to delight little guests when they discover her mixed among the food! 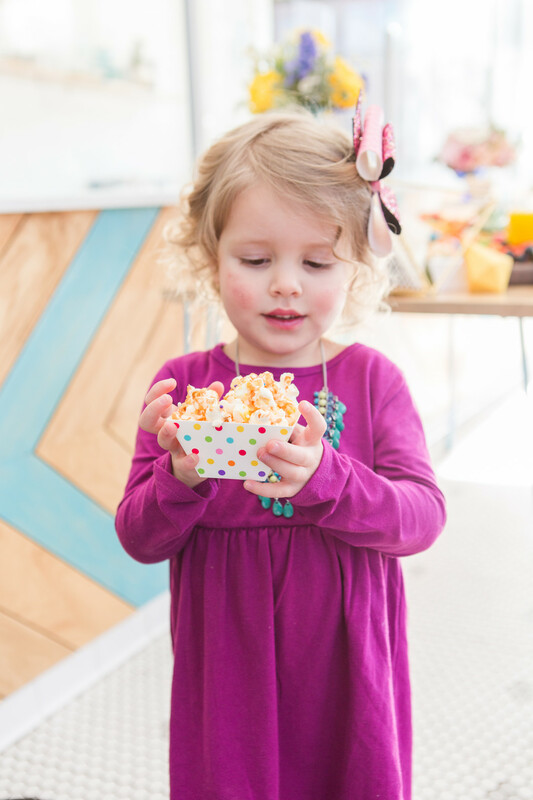 How darling does this little lady look eyeing her popcorn in that colorful treat box? 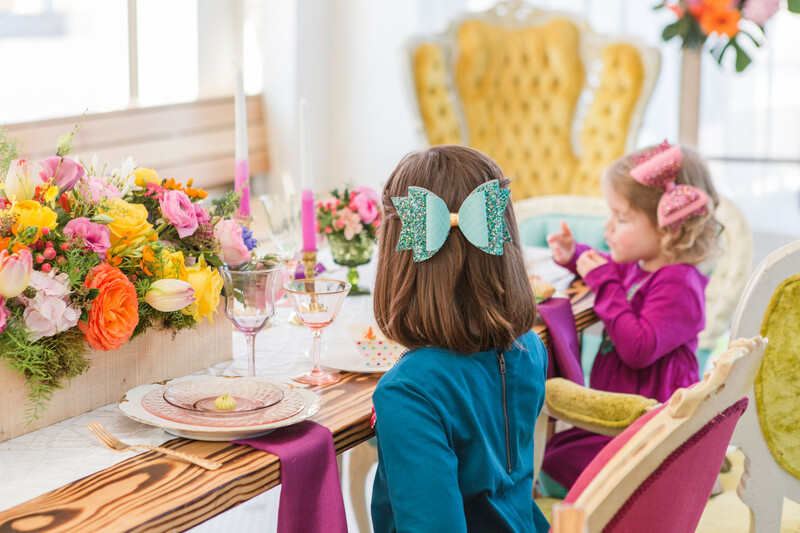 It looks like the girls, wearing perfectly coordinated custom bows from The Glittered Pear Bowtique, will enjoy an elegant spring birthday party full of bright sweet treats, surrounded by dazzling geometric design! 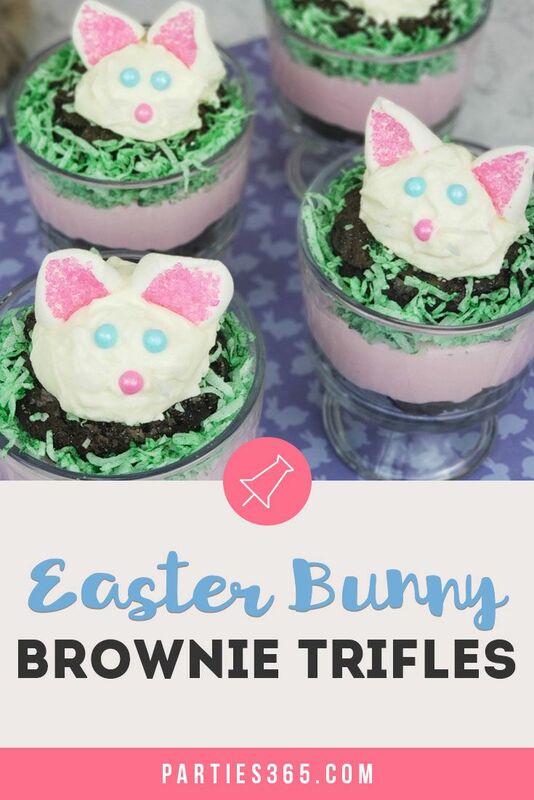 Be sure to Pin this post for later party planning inspiration!